We’ve been feeling a little nostalgic this week and have been looking back in our archives. 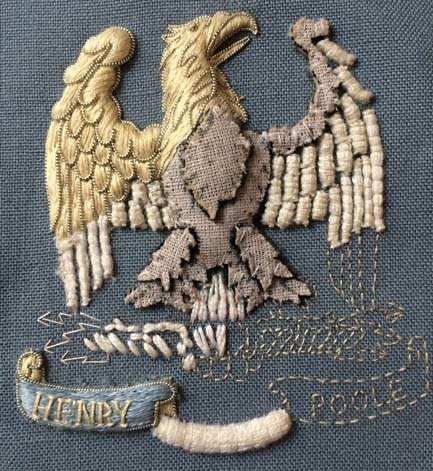 This mostly consists of Heraldic embroidery which is Claire, our founder’s, speciality. Consisting mainly of Lions and Unicorns ….. over the last three years we have built a rather remarkable collection of embroidery artworks. This traditional style of embroidery, when done well, hinges on padding (‘raisings’ for the initiated) to create the wonderful dramatic pieces we are best known for. Above you can see the padding underneath and the finished stitches which are a combination of silks, accented with goldwork. This style of crest can be found in both family histories and established businesses, centring around the escutcheon (shield) which displays the ordinaries and common charge on the field. The complexity will depend on what level of acheivement the bearer is entitled to. The below is an example of a full heraldic achievement which consists of shield, supporters, crest, and motto bannered underneath. We can also offer a drafting and framing service along with the embroidery. Prices start from £95 depending on size and complexity. A piece like this will last a lifetime, making a beautiful birthday or wedding gift. Alternatively it could make an intriguing trophy piece or a great talking point for a room.